IMAGE: A photomontage of the Dominick Street Luas stop, just off Parnell Street. — New turning and one-way restrictions added to existing ones. 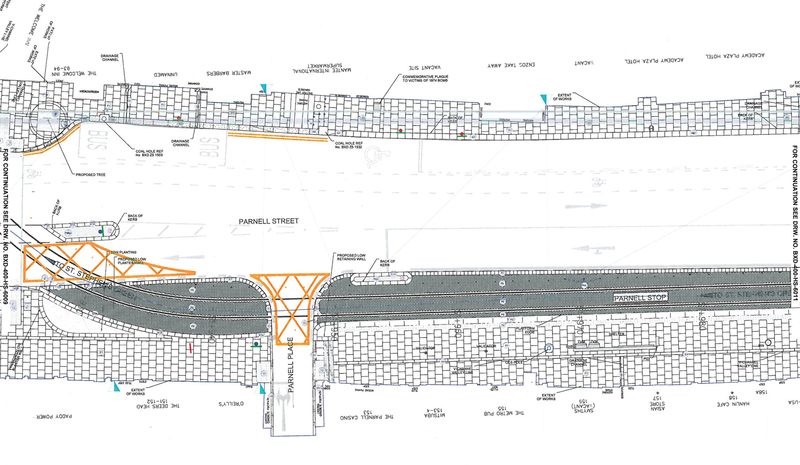 Conditions for cycling on Parnell Street will be downgraded under plans for Luas Cross City — this is despite the fact part of the street is a planned primary cycle route. 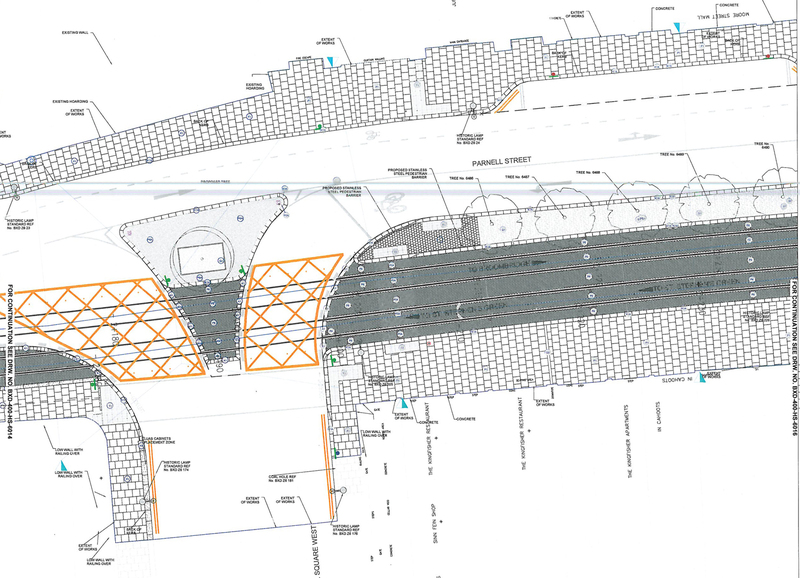 Construction drawing for Luas Cross City released to IrishCycle.com after a Freedom of Infromation request shows the extend of the problems with the tram project and cycling on Parnell Street between Dominick Street and Marlborough Street. 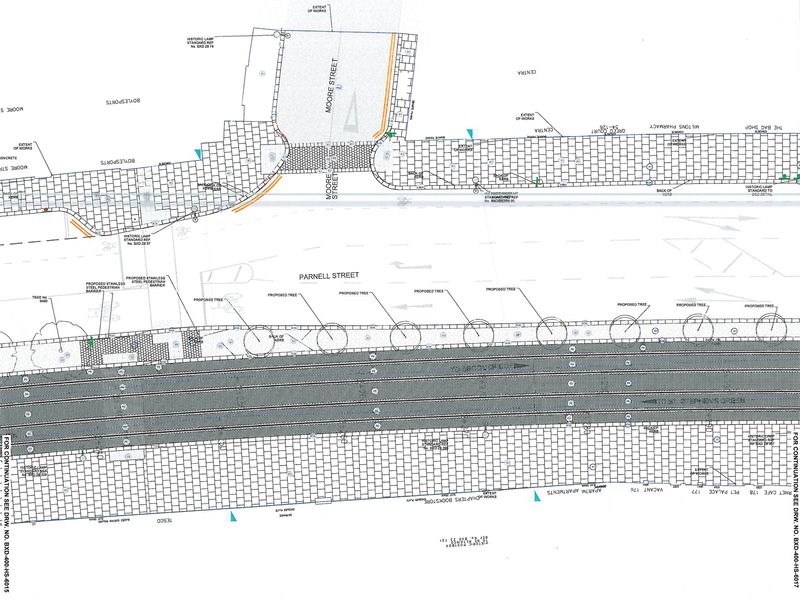 Issues include the removal rather than upgrading of advisory cycle lanes on Parnell Street at both sides of the north end of O’Connell Street; the mixing of people on bicycles with buses, and lanes shared with buses and general traffic crossing trams tracks at unsafe angles. 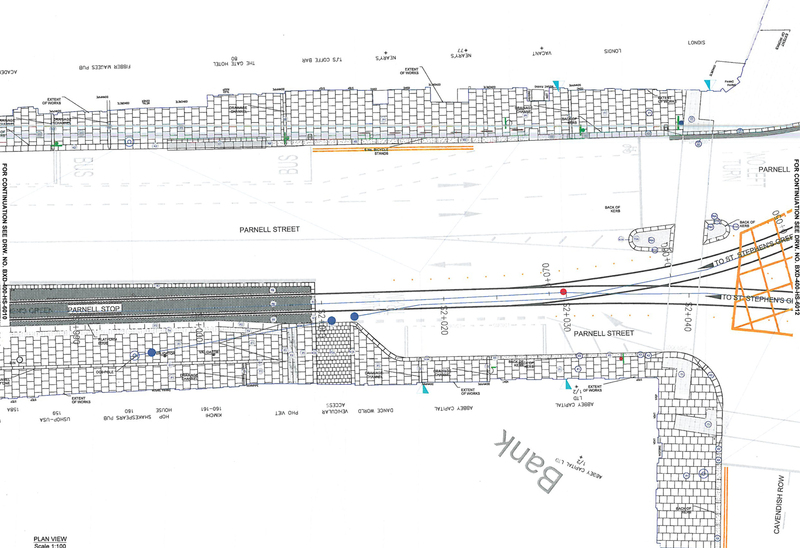 As we’ve previously reported, planned contra-flow will not be provided on Parnell Street (see map below). At one point in the design, a right turning lane into Moore lane and maintaining two lanes westbound are prioritised over having southbound cycle lanes. This is in an area of the street which does not have bus routes. The cycle lanes provided are also against advice in the National Cycle Manual which states that dash-line cycle lane markings should be upgraded to solid-line markings. 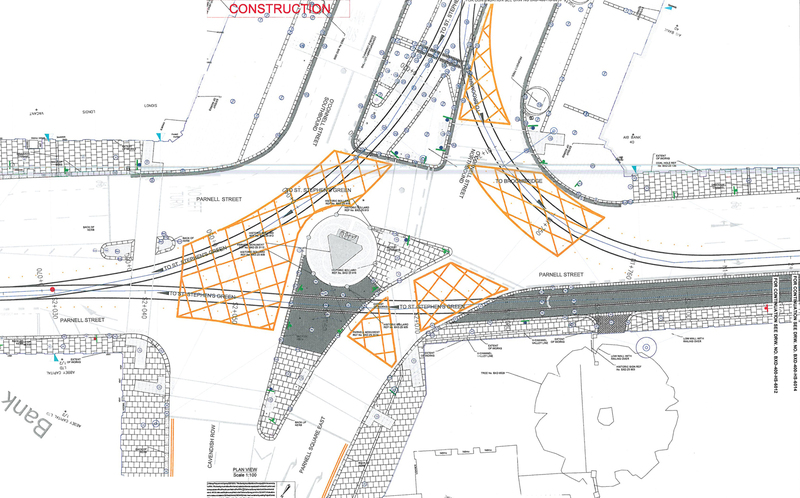 IMAGE: Map overlay by IrishCycle.com showing the Luas tracks route (yellow), the removed eastbound cycle tracks on Parnell Street (red), and the one-way section of street with no contra-flow (light blue). The design also seems to go against the Design Manual for Urban Roads and Street in a number of areas, including: wider turns than recommended, a lack of crossings at every arm of junctions, and giving minor side streets and even private entrances visual priority over busy footpaths. 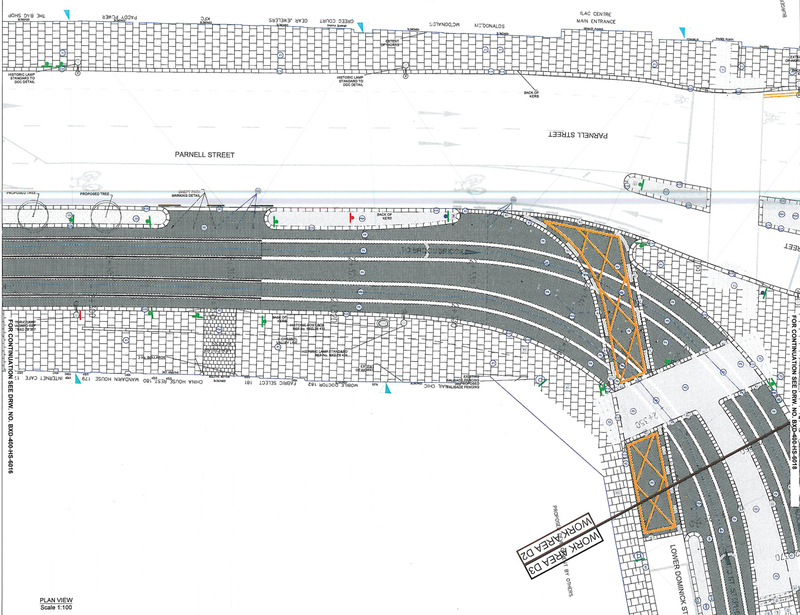 At the top of O’Connell Street pedestrians will still be expected to use three seprate pedestrians crossings to cross one roadway. 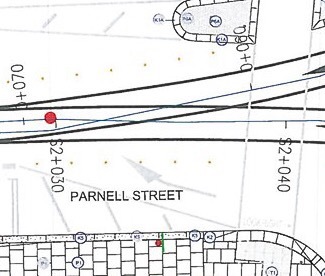 Footpaths are to be widened in locations but the widening is mainly on the northside of Parnell Street, not on the busier southside of the street. When the tram tracks started to be installed in streets, the Luas Cross City team were commended for clear communications around crossing tram tracks at as close to 90 degrees as possable. At the same time, however, the design team for the project were not keeping that principle in the design of routes for bicycles (see example image and drawings below). 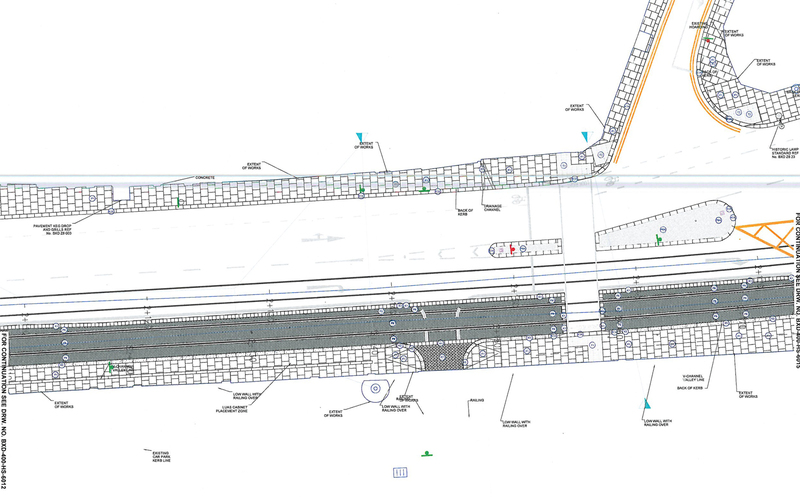 In June we reported that there are few signs of cycling-friendly designs across the Luas Cross City route as many restrictions will apply, but this is the first time the detailed drawings of Parnell Street with lane markings are published. 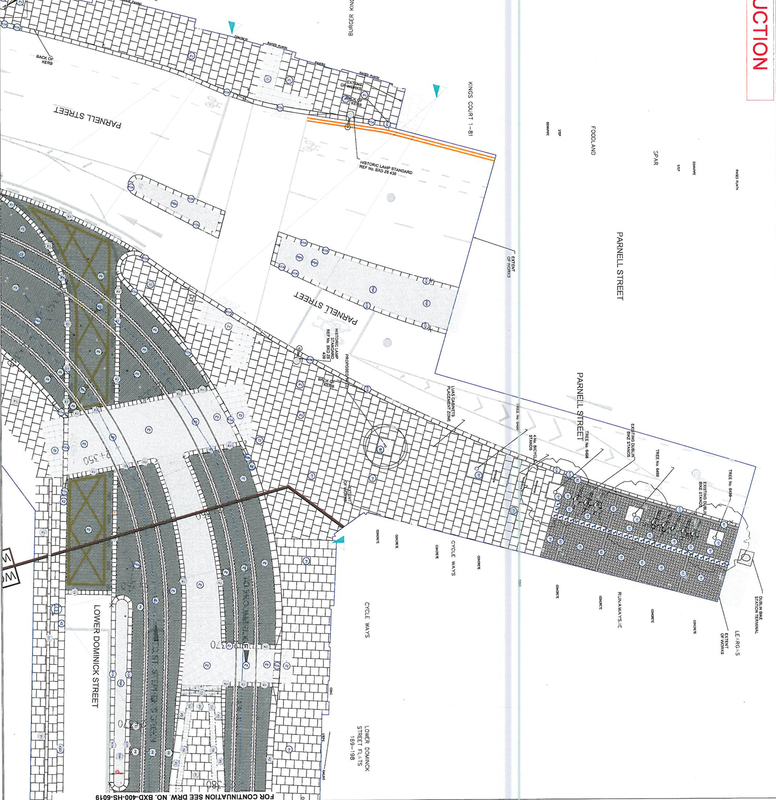 When reporting in June, we asked the Luas Cross City team will the existing cycle lane in this area be replaced, improved or removed, the project team said: “The currently proposed Luas Cross City design includes an advisory cycle lane”. No mention was made of the removal of the cycle lane in one direction. Luas is creating a cycling-hostile city by its expunging existing free-passage for cyclists. Post Cross-City works the reality will dawn. It is well to remember that Dublin City Canal Cordon Count for 2015 (morning rush hour data) shows that Luas lines transported 12.5k passengers vs 10.9k by bike. And at what capital cost per km? This appears to be an over-engineered LUAS solution versus an under-engineered cycle provision… The balance appears to have shifted from the original reassuring two -mode solution to a major traffic problem, to one that favours the more technical (and vastly more costly) of the two; we have reason to be vigilant – and not just of the front wheel in tramtrack situation! They truly do not get it. Public Transport should reduce private vehicle use, not reduce bicycle use. The most frustrating thing about not providing contra-flow cycle lanes is that it doesn’t stop cyclists from attempting that movement, they will just do it dangerously or on footpaths. These drawing really do show that the issue isn’t to do with money as much as it is to do with the willful ignorance of the needs of cyclist. There is no marginal cost here to incorporate good cycling infrastructure, but even then they fail. Priority is being given to public transport and rightly so – cars still need access for shopping etc. In any case, the city centre is mainly for pedestrians with public transport and cars given their rightful place. Cycling is IMO unsuitable on busy city streets – there’s insufficient room for pedestrians as it stands – even where motor traffic has been cut to a minimum. 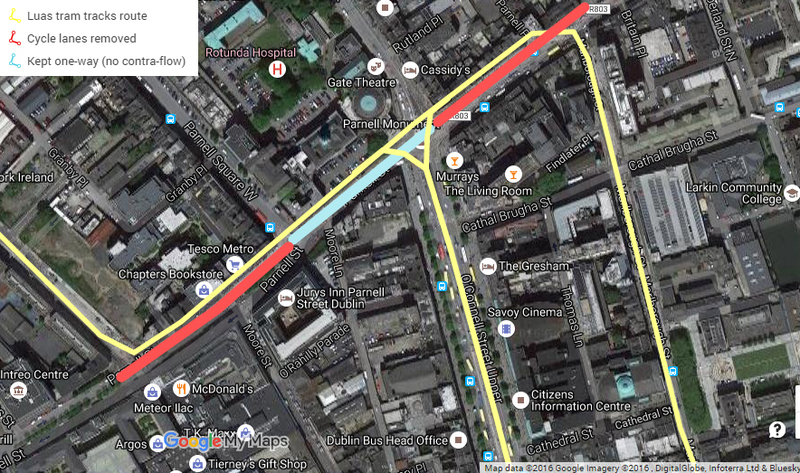 @BlackQueen – where in Dublin has motor traffic has been cut to a minimum? I guess you’re new to Dublin – there’s O’Connell St where the vast bulk of traffic are buses on 4 lanes along with very wide footpaths – the same is very badly needed on O’Connell Bridge as the footfall is huge – no room for cycling there (3 different velocities of traffic won’t work in an area where so many thoroughfares intersect). Parts of St. Stephen’s Green (West in particular) has the bar minimum for all motor traffic including buses – mind you, the Luas will effectively restore through traffic there as trams can be counted as traffic – it’s needed though as are wide footpaths and pedestrian spaces. The Collage Green area has the bus gate and car traffic has been vastly reduced – pedestrians travelling between the two main shopping districts need all the space they can get. 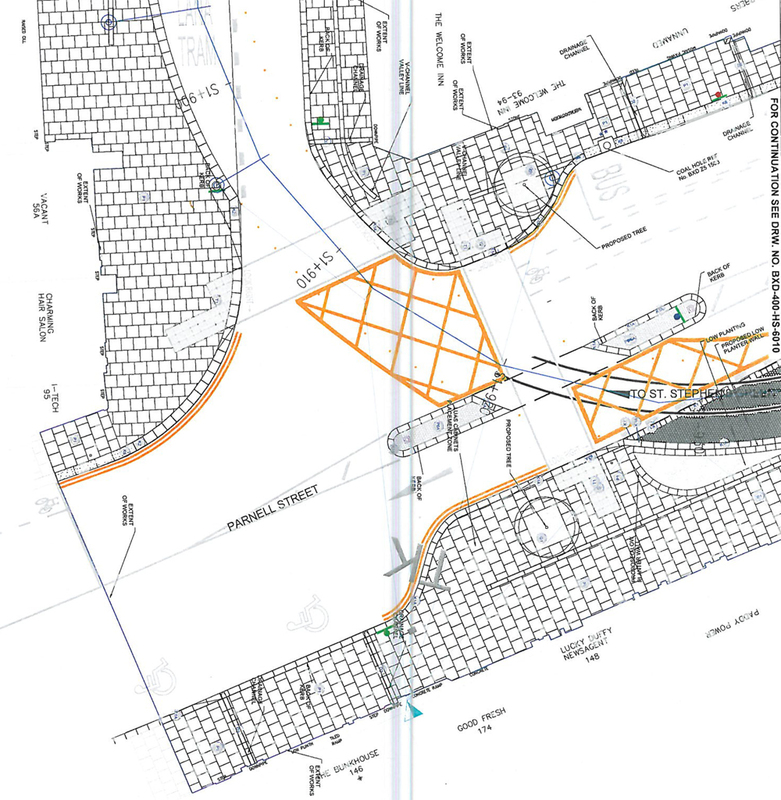 Of course, there are the pedestrian precincts of Henry Street, Temple Bar and Grafton Street and these are very constrained during the day – surround streets need to be given to pedestrians rather that cyclists, because that’s what is needed. surrounding streets need to be given to pedestrians rather than cyclists, because that’s what is needed. Grafton Street and Henry Street are islands surrounded by streets clogged by cars and not at all given over to pedestrians — that’s hardly minimising cars space compared to cities of similar sizes to Dublin. Amsterdam and smaller cities such as Utrecht make a great example to follow where a mix of walking, cycling and public transport are given priority while still allowing car access… maybe you need to stop looking st things from your anti-cycling point of view?